'Pros on the Go', a Fierce Tartan company are seeking insurance partners to pilot its new solution for streamlining the claims process. 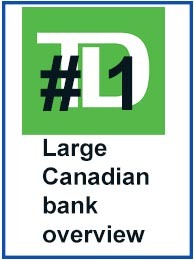 Using financial data, Mark Sibthorpe compares the performance of TD bank to its rivals. TD grew faster in 2017 than its rivals, but was cited for aggressive sales practices. 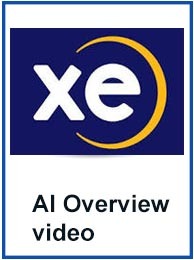 XE.com explains their Big Data and AI strategy. This video covers XE.com's presentation at the AI, Big Data and Analytics event which took place in Toronto February 7/8, 2018. Cecelia Tamez and Jean Louis provide insights into their evolution and winning strategy. Greenpeace's campaign to stop TD financing the oil sands is delusional. Trillions of dollars are at stake for the banks and the Canadian economy. This video explores the related financial issues. 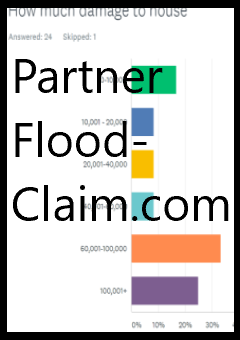 Insurance flood US vs Can comparison. 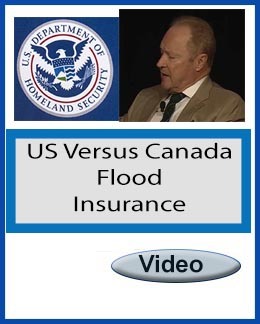 This video provides an overview of the main differences between Canada's approach to overland flooding versus the US approach. 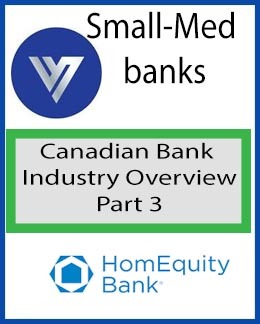 Canadian bank overview part 5, medium-large banks. Banks include Manulife, Tangerine and Laurentian Bank. 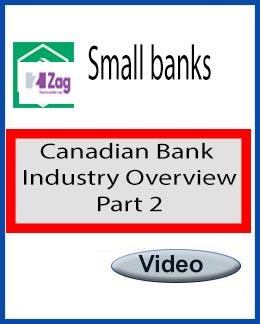 Overview of small-medium size banks in Canada. Banks covered include Versabank, Hollis Bank, Equity Bank and Caisse Populaire Acadienne. Jamie Dimon calls bitcoin a fraud used by criminals, yet he has jumped into the blockchain with both feet. 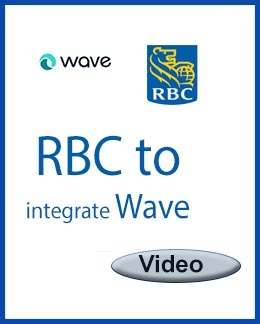 RBC invested $24 million into Wave Technologies and now they will roll out Waves accounting, invoicing, reporting and billing platform to SMEs. 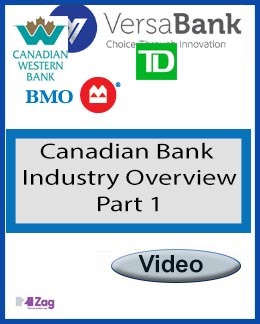 Overview of Canadian banking industry. 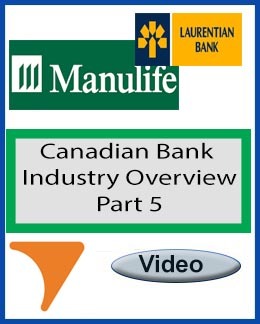 This multi-part series looks at issues facing Canadian banks from a variety of angles. Part 1 examines the types of banks and scale using ROE and EBITDA as measures. 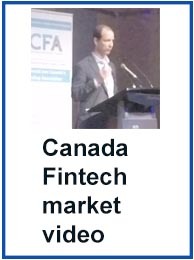 Latest news and events for Canadian financial service companies, analytics, fintech and AI. BankNews.TV provide the latest technology news and reports for banks and insurance companies looking to compete in a rapidly changing market. Analytical information and financial information related to technogies that can change your business. Please download and complete the data template that you need to upload. See financial data upload section above for details of how this data will be used. Observations and overview of 2018 NB flood support from government and insurance companies. "The findings showed that aftermath stress contributed to poor mental health outcomes over and above the flood itself, prior mental health issues and demographic factors," Ms Dixon said. "Aftermath stress was the strongest predictor of post-traumatic stress symptoms with 75 per cent of people saying the most difficult aspect was the aftermath and dealing with insurance companies," she said. With this in mind, I felt it was important to understand how New Brunswick flood victims were treated. Argentina is in the news daily because the situation is dire, and may be an indication of further contagion. The most dramatic story that speaks of the a leading cause of its troubles was the recent arrest of the public works secretary, Jose Lopez. June 15th he was caught hiding millions in cash in a monastery. No this is not a plot for a comedy. This report covers flood news in Canada from 2017 to present and highlights the relevent issues for home-owners and the insurance industry. As states across the US legalize marijuana for both medicinal and recreational purposes, it has fueled a growing industry of marijuana related businesses (MRBs). With Walmart Pay about to userp Apple Pay, I thought I would share my 2014 book on mobile payments and loyalty. The guilde was written for Merchants that want to understand loyalty, credit, mobile payments and Apple Pay, but anyone involved with credit and loyalty might find it useful. The book is a prelude to Walmart leaving MCX, and chronicles the evolution that led to Walmart Pay. There is an extensive case study of Walmart that looks into its efforts to become an ILC and to avoid paying credit card transaction fees ('merchant discount'). It offers readers a step-by-step methodology for evaluating and transforming credit and loyalty programs. The strategies are based on proven examples and industry facts. The Nectar, Target, Canadian Tire and Walmart case studies are examples of the practical approach I have taken, written with the intent that merchants can use them as blueprints for their own initiatives. 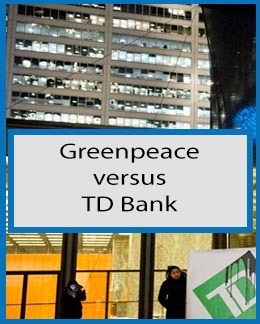 TD’s share price recently collapsed by $7 bn in one day due to CBC’s allegations of aggressive selling tactics. A huge fall from a bank that was trading at a premium as recently as January. This was even before the most recent allegation of TD attempting to avoid paying taxes on advertising. This report chronicles the events leading up to the collapse, shows TD's performance, analyses other related issues. This is a book review of the book Back from the Brink by Paul Halpern, Caroline Cakebread, Christopher C. Nicholls and Poonam Puri. Footnote 151 implies an important regulatory change related to derivative contracts. It means that US Banks will not be required to hold as much capital against commodities. If you want to understand the implications of this regulatory change in more detail, see the enclosed related article detailing the changes. For contextual purposes, I have also included two Rolling Stones Magazines reports from 2010 and 2014 that chronicle the role large US banks have played in manipulating commodities. You might question the credibility of these sources, but rest assured, these reports are based on United States Senate hearings which outline the issues in a 396 page report related to the implied risks. Consumer debt spending appears to have insulated Canada from the worst of the credit crisis, but now the alarming magnitude of consumer debt ($1.92-trillion) could exacerbate a day of reckoning. This report assesses the issues at hand and recommends the solution to get Canada's economy on track. Gamification of business processes resulted on Mint.com growing to 10 million users within 4 years. This report explains how. Will Canadian banks charge companies for deposits? In light of today’s possible rate cut, this report discusses how a bank rate cut and capital ratio pressure could precipitate negative corporate deposit interest rates in Canada. Review of the Canadian Tire Financial Services deal with Scotiabank, risks, opportunity and benefits. This report looks at Joe Oliver, minister of finance’s progress to date, and assigns a grade to his government’s performance to date. Branches are evolving to meet the digital age. This documents tracks the evolution with real-world examples. Whether he knew it or not, Tom Reid, a senior vice-president at Sun Life, made a case for the behavior modification concept ‘Nudging’ when he recently proposed auto-enrolling Canadians in his company’s pension plans. Sun life cover 1.2 million Canadians, about 60% of the eligible employees. 2. Deposits dropping which will increase cost of funds in the future. This report looks at Canadian challenger banks (apart from merchant led banks) and explains why they have not threatened larger institutions. It also looks at ways in which these upstarts have achieved success. This document contains details on how BankNews.TV is helping kids learn programming via gamification of financial data. Canadian banks have made money throughout the credit crisis, but this trend may be about to reverse. The rational supporting this prediction is that revenue has grown despite a declining net interest margin (NIM). It has grown in spite of this fact because Canadian debt (loan lease volume) has risen significantly, as shown in chart 2. 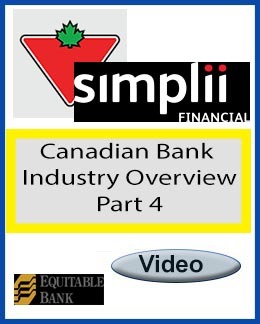 This report looks at the issues facing Canadian banks in the event of a Bank Rate rise. Yesterday, the Attorney General of Switzerland (OAG) opened criminal proceedings related to the FIFA scandal. This report outlines some of the events related to the criminal investigation, with a particular focus on banking. March 18, Finance Minister Jim Flaherty resigned from cabinet after having endured a difficult year due to health issues. This report looks at his legacy and attempts to grade his government’s performance to date. Merchant led financial services are growing in importance once again. This is exemplified in the ongoing UK rivalry between ASDA, Sainsbury and Tesco. Together these merchant/financial service companies provide the backstop for three different approaches for merchants looking to extend their financial services. Canadian and London real estate, like Macau, may also be a convenient means for China’s elite to move money offshore; with the deleterious effect of driving up home values. Louise Shelley`s research concurs. In a published paper written for the National Defense University, Shelley argues that money laundering in real estate (MLRE) increases prices. questionable Chinese practices, record US debt levels, and a shaky economy. Riches to Rags? Summary of possible risks for Genworth MI CANADA, INC.
Genworth had its Q4 2014 earnings call. Genworth own about 30% of the mortgage default insurance in Canada. Not surprisingly, the earnings call became focussed on Alberta; and for good reason, with 20% of its outstanding insured mortgage balance in Alberta, sensitivity to the oil shock and how Genworth plan to manage related risks were discussed in detail. Based on historical financial data (see detailed charts pages 5-8), the oil based recession in Alberta, and comparison against two of its peers, this document outlines my observation with respect to CWB’s future performances. This report examines liquidity issues in the Canadian financial service industry. Recently the CBC and The Globe and Mail both reported on what has been referred to as a consumer “bank fee outcry”. CBC compares banks to cable and phone companies, standing accused of trying to gouge customers with service fees. The backlash appears to have originated in conjunction with the NDP and the Consumers Council of Canada which argues that there is anxiety ‘among consumers about banking fees’. Cheap oil has pushed the Bank of Canada's governor, Stephen Poloz onto a slippery slope. For some background on this, take October 22nd, when Poloz bid farewell to forward guidance, resulting in yesterday's surprise rate cut. A cut that has enraged TD and other banks, which see this as eroding profits. This report explores Canada's strategies to compete globally. The report begins with an analyses of the housing market, because housing is the canary in the coal mine; explores what happens in the event of collapse; and analyses the underlying problem causing Canada to be uncompetitive. Merchants that want to understand loyalty, credit and mobile payments should read this book. It offers readers a step-by-step methodology for evaluating and transforming credit and loyalty programs. The strategies are based on proven examples and facts. The Nectar, Target, Canadian Tire and Walmart case studies are examples of the practical approach I have taken, written with the intent that merchants can use them as blueprints for their own initiatives. Read sample report: Guide to system selection. This sample would normally cost $99 but is available free as a sample.Â Click here view sample report. HOW CAN INSURANCE BROKERS USE RATE COMPARISON SITES TO BOOST THEIR BOOKS OF BUSINESS? Enter, rate comparison websites. They’re all the rage in the UK and the USA, where consumers use comparison sites to shop for insurance much like Canadians do when comparing travel costs on sites like Expedia and Trivago. But Canadians are slowly starting to catch on to the insurance comparison trend. They’re searching for and finding platforms like LowestRates.ca, which is enabling consumers to compare insurance premium prices across a number of product lines, primarily in auto and home insurance. Beijing’s crackdown on foreign investments is deterring Chinese companies from making large purchases of Canadian hotels. Private equity company Blackstone Group and a Los Angeles real estate trust have a deal to buy Anbang Insurance Group’s office complex in Vancouver, the companies announced on Wednesday. Canada’s property boom has increased household wealth, but real estate purchases have left immigrants with a bigger debt burden than residents who were born here. Following a month of surprisingly strong indicators on the economy, it is an interesting thought experiment to imagine what it would take to make Bank of Canada governor Stephen Poloz actually adjust Canadian interest rates this year. Oil prices jumped more than 2 per cent on Monday to a near six-month high, on growing concern about tight global supplies after the United States announced a further clampdown on Iranian oil exports. The Canadian green bond market is expanding as more companies are looking to raise money to fund environmentally friendly projects. How has the past decade been for you? Are you happy with your financial progress? Everyone knows China’s stock markets aren’t for the faint-hearted. But plain vanilla assets can be equally scary. People deemed untrustworthy in China have been blocked from the purchase of more than 25 million plane and train tickets, as the country works to build a social-credit system designed to monitor and shape the conduct of its citizens. If the polls are to be believed, Prince Edward Islanders could elect Canada’s first Green government in Tuesday’s provincial election. This would be the second time in one week that an incumbent premier with a majority government was defeated after a single term in office. If the Bank of Canada listens to what Canadian businesses are saying about their state of mind and their prospects, then interest-rate hikes could be on the shelf for a long time. The question is whether the central bank should believe what it’s hearing. After paying a nine-figure sum for some of the brightest minds in Canadian artificial intelligence, Toronto-Dominion Bank is trying to use tech to bring back what tech has greatly diminished: the personal touch of a trusty branch manager. The data agency said Wednesday that Canada's consumer price index rose from 1.5 per cent in February to 1.9 per cent in March. The 1.9 per cent figure was in line with what economists were expecting. Merrill Lynch quantitative strategist Savita Subramanian has a new trade idea – sell U.S. utility stocks and buy U.S. financial stocks – for a potential gain of 20 per cent in the next 12 months. Could this trade also work for Canadian stocks? Morgan Stanley reported a 9-per-cent drop in quarterly earnings on Wednesday, but managed to beat analyst estimates through slight growth in its wealth management business, as well as cost cuts. Regulators should reconsider a stress test for uninsured mortgages that was imposed amid an already slowing housing market and that has helped fuel an alternative-lending boom, a Canadian Imperial Bank of Commerce economist said Tuesday. JPMorgan Chase & Co shuffled the jobs of two of its most senior women executives on Wednesday, moving Chief Financial Officer Marianne Lake to a role leading consumer lending and naming the head of card services Jenn Piepszak to replace her. Bank of New York Mellon Corp said on Wednesday it expects net interest revenue to decline again in the current quarter as the world’s largest custodian bank pays higher interest rates to attract deposits, sending its shares down 9 percent. Many Canadian investors hold a couple of truths to be self-evident. One is that big banks rule. The other is that only stocks with big dividend yields deserve to be considered as potential investments. “Buyers hold a strong hand in several of Canada’s large markets at this stage, while policy makers will view lower prices as (good) signs of improving affordability that require no further intervention,” Mr. Hogue said in a report. Lower market volatility took a bite out of the equity trading revenues at some of the big U.S. investment banks and analysts say a similar theme could play out north of the border, as well. It's pretty clear that the explosive growth in the price of Canadian houses over the last decade was the inadvertent product of an emergency plan to rescue global capitalism in 2008. Only one in 10 people feel very comfortable investing on their own, and only one-fifth are currently DIY investors, the survey found. However, half of respondents said they would like to be able to invest online by themselves. The Quebec government has revealed a new disaster relief program – one that puts limits on the amount of compensation given to homeowners in flood zones. Neuberger Berman's Steve Eisman, the money manager made famous by the book 'The Big Short' and its film adaptation, joins BNN Bloomberg to discuss why he's short Canadian banks. The probability of a recession in Canada is “small but rising,” Bank of Nova Scotia says. This increase in D&O insurance premiums is being driven by more and more lawsuits being filed against non-US firms. “If I can get your details from one site and use them on another like your Uber account, PayPal or an airline, I can start using your accounts for financial gain,” Lindsey Nelson, international cyber practice leader with specialist insurer CFC Underwriting, said Friday. “We are seeing our retention of customers who are on usage-based insurance is significantly higher than just normal retention, because once a customer gets on if they have earned a discount, then they are going to keep earning that discount going forward,” Tisdale told Canadian Underwriter. The best place to make money in the world of finance and investment may not be at a bank but in real estate. Goldman Sachs Group Inc.’s first-quarter profit fell sharply as trading and underwriting slowed, showing the urgency of the firm’s pivot away from those unpredictable Wall Street businesses. Citigroup Inc. said its first-quarter profit rose 2% from a year ago, boosted by growth in U.S. consumer banking and solid trading performance compared with rivals. The claim, brought under the Consumer Rights Act of 2015 which paved the way for class action lawsuits, is being led by former financial ombudsman Walter Merricks, who alleges that the card scheme imposed "illegal" interchange fees that were ultimately borne by UK consumers. This Notice is directed to the attention of all banks, authorized foreign banks, trust companies, loan companies, cooperative credit associations, cooperative retail associations, life insurance companies, property and casualty insurance companies and fraternal benefit societies (FRFIs). Canada is considering a move toward open banking, a formalized system in which consumers are empowered to share their bank-held data with third-party providers (TPPs) to encourage competition and innovation. If the experience in Britain is a guide, this advance will transform the country’s economy and improve outcomes for consumers, businesses and financial institutions (FIs). Canadian Imperial Bank of Commerce is making significant leadership changes that span wealth management, capital markets and retail banking, including naming CEO Victor Dodig’s brother as head of retail brokerage Wood Gundy. A report Monday is expected to show Canada’s housing market staged a “mild rebound" in March, while a key price measure eased to its slowest pace in almost 10 years. When the Bank of Canada went looking to fill a vacant spot on its policy-making governing council in 2018, it hired a global executive recruiter and posted a long list of qualifications. “Ontario’s economy is expected to grow at a steady pace over the 2019 to 2024 period, moderating from recent years mainly due to a less supportive external environment,” the budget says. U.S. government-bond prices fell after better-than-expected Chinese economic data helped sap demand for safer assets. U.S. government bond yields fell following an underwhelming report on consumer prices and cautious remarks from central bank officials. Citigroup is refunding more than A$3 million ($2.2 million) to retail customers in Australia who suffered losses from complex investments sold by the bank without adequate advice, the country’s corporate watchdog said on Monday. The scenes were familiar: another aged Arab leader, this time 75-year-old Omar al-Bashir of Sudan, being forced from power by a young and jubilant pro-democracy crowd on Thursday, just nine days after Algeria’s 82-year-old president Abdelaziz Bouteflika was ousted by similar throngs of flag-waving demonstrators in his country. Manulife Financial Corp. is eliminating its chief operating officer role as it redraws reporting lines for seven key divisions, according to people familiar with the matter. Boomers who own houses worth many times what they paid have a retirement planning advantage that may never be equalled by future generations. Artifical intelligence is set to transform businesses in ways we’ve not seen since the industrial revolution. The digital era is evolving in the wealth management sector, leading to a dynamic increase of AI and robo-advisory tools. 25% of 600 banking professionals, surveyed by MoneyLIVE and presented at FStech, said they used AI at a moderate extent. The growth of AI will “plug the current gap in data science skills, predicting that by 2020 more than 40% of data science tasks will be automated” according to Gartner. By way of evidence, let’s take a few figures from the report. The complement of 12 banks live on RTP at the start of 2019 is projected to double to 24 by the end of the year. That may not sound like a massive increase, but it will bring the proportion of demand deposit accounts able to transact in real-time through RTP to 70%. And further rises in connections will likely take that figure to 90% by the end of 2020, putting ubiquity within reach. When Honda Motor Co. opened a car plant in Swindon, England, in 1989, the company said it would be the cornerstone of its European operations. 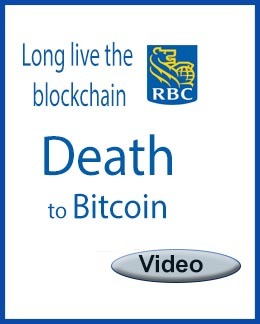 The proposed class actions were filed on behalf of RBC investors who held units of the RBC Canadian Equity Fund at any time from June 1, 2005, to present, and TD investors who held units of the TD Canadian Equity Fund at any time from Jan. 1, 2010, to present. The action would still need to be certified by the court; no timetable for a hearing has yet been set. If certified, those investors eligible to join the class action would be notified. “U.S. hedge funds from time-to-time have appeared in this country over the last 10 years, with the same hypothesis of shorting Canadian banks, and it hasn’t worked very well for them,” said Brian Porter, president and CEO of Scotiabank, in response to a question at the lender’s annual meeting of shareholders in Toronto. Scotiabank’s Caribbean banking asset sale — involving Anguilla, Antigua, Dominica, Grenada, Guyana, St. Kitts & Nevis, St. Lucia, St. Maarten, St. Vincent and the Grenadines — forms part of a broader campaign by the bank to focus its energies on its core markets. The World’s Most Ethical Companies assessment is based upon the Ethisphere Institute’s Ethics Quotient (EQ) framework, which assesses a company’s performance in five key areas: ethics and compliance program (35%), culture of ethics (20%), corporate citizenship and responsibility (20%), governance (15%), and leadership and reputation (10%). Intact Financial has revealed that severe winter weather led to net catastrophe and non-catastrophe weather losses of about $165 million, before tax. Kinney is currently vice chair of banking advisory for Deloitte Canada. If she is elected by shareholders, women will make up 41.6% of the board of Intact, which led the Canadian P&C market in 2017 with 17% market share and $7.9 billion in net premiums written. Today, the Office of the Superintendent of Financial Institutions (OSFI) released the final version of its Guideline B-2: Large Exposure Limits for Domestic Systemically Important Banks. Canada’s privacy commissioner says Equifax fell short of its privacy obligations to Canadians during and after a global data breach in 2017. Standard Chartered Plc has agreed to pay $1.1 billion to U.S. and British authorities for conducting illegal financial transactions that violated sanctions against Iran and other countries, government authorities announced on Tuesday. When a car is classified as a write-off, that usually means it’s time for a new one. As many consider Ontario’s system of auto insurance regulation as badly broken, could the same guidance be applied here? Federal regulators proposed easing a rule that required big banks to plan annually for their own demise, the latest move by regulators under President Trump to loosen controls put in place after the financial crisis. Societe Generale, France’s third-largest bank, unveiled on Tuesday a plan to cut 1,600 jobs, mainly at its corporate and investment banking arm, in a bid to buoy profitability after last year’s poor performance. This year, London will be home to just as many fintech ‘unicorns’ as current global leader San Francisco - according to the report from Robert Walters and market analysis experts Vacancy Soft. Guests have access to limited data set. Free trial users have data access but this message displayed until subscription paid. Displayed data is for demo purposes. To login or subscribe for full access, click here. A new study from Statistics Canada shows that immigrants owed significantly more than their Canadian counterparts, leaving newcomers more vulnerable to higher interest rates and an economic slowdown. Since the Great Recession, Canadians have been borrowing heavily and pushing household debt to levels that are seen as a risk to the financial system over all. The study looked at household assets and debts in 1999, 2005, 2012 and 2016, the most recently available data. It shows the debt-to-income measurement had climbed for both immigrant and Canadian-born families, but the level was substantially higher for immigrants. The debt-to-income ratio for established immigrant families hit 217 per cent in 2016 because of large mortgages, according to Statscan data. In comparison, older Canadian-born families had a debt-to-income ratio of 132 per cent. “We know that when it comes to new immigrants, many of them see real estate as an important factor. They would like to own something physical. This means that they are willing to take large mortgages,” said Benjamin Tal, deputy chief economist with CIBC. “The attachment to real estate is very different. There is an urgency to get something after arriving or establishing themselves,” he said. For those who were in the country for less than a decade, the debt-to-income ratio was about 250 per cent, and for those who had been in the country for 10-to-19 years, the ratio was nearly 300 per cent. The acquisition of the four office towers called Bentall Centre will give Blackstone and Hudson Pacific Properties Inc. a stake in one of the hottest office markets in Canada and the United States. The deal marks the beginning of Anbang’s exit from Canada, about three years after the Chinese insurance conglomerate vastly outbid rivals for big Canadian properties. The sale is part of the indebted Anbang’s wider restructuring, which includes potential divestitures of U.S. properties. Anbang, which was seized by Beijing in early 2018 amid debt and corruption charges, is now looking for a broker to handle the potential sale of a much smaller office building in downtown Toronto, according to two sources. The sources were granted anonymity by The Globe and Mail because they were not authorized to comment publicly on the matter. That building is known as 70 York Street and could attract a larger group of buyers, given that the price tag will be substantially lower than the $1-billion-plus that Anbang was seeking for Bentall Centre. The state-controlled company has not yet taken concrete steps to sell its other Canadian asset, a B.C. seniors-living chain.